Hartwig was a dear friend who inspired many Mercedes-Benz owners around the world by sharing his stories through a dedication to amateur photography. 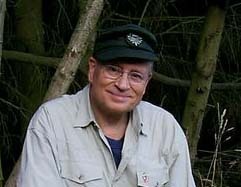 His American friends and the "American Way" always meant a lot to him, and I am privileged to have enjoyed his "overseas" friendship for more than a decade. Let us keep him in our hearts. 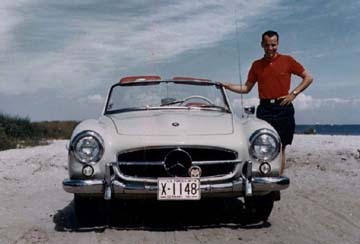 Hartwig Mueller worked as a salesman for Georg Diekmann Automobile (authorized Mercedes-Benz dealership) in Germany from 1956 until 1964. 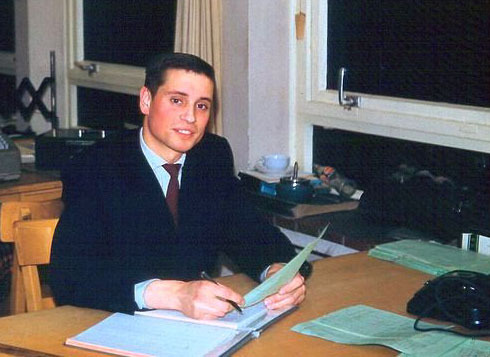 He was trained in Stuttgart-Untertuerkheim, at the "Hauptverwaltung" (Main-Administration-Center). 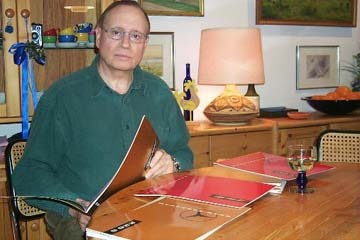 A salesman proud of his product! 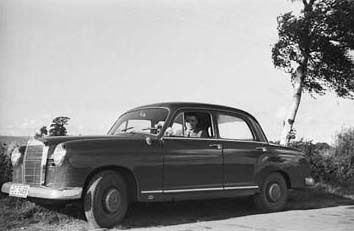 Hartwig in 1960 at the wheel of one of his demonstrators. 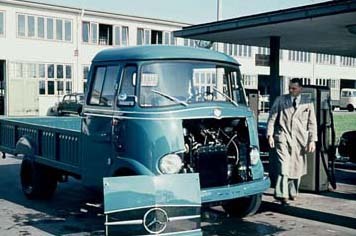 This was the first Mercedes-Benz 190Db, and the color was "Medium-Blue." 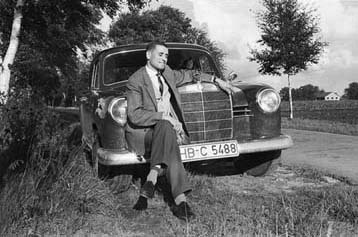 Hartwig at his Daimler-Benz office in 1958. 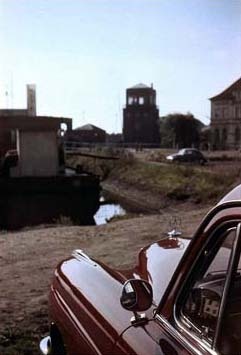 A 1958 Type 219 sedan in "Medium-Red" in front of the M-B service area of Georg Diekmann Automobile in Bremerhaven-Mitte, Am alten Hafen 117, where many American servicemen ordered and picked up their new Mercedes and shipped it by "vehicle processing" to the United States in the 1960s. I guess a lot of our American customer friends will remember this place as it looked back then. 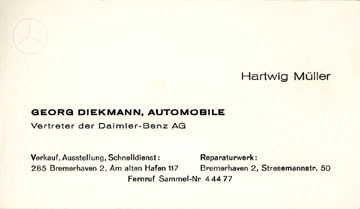 I worked for Diekmann Automobile as a salesman for over eight years from 1956 until 1964. 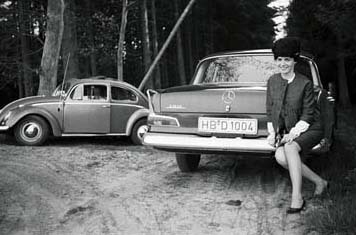 In the background you can see a black M-B 170V, that famous model before the first Pontons were made. 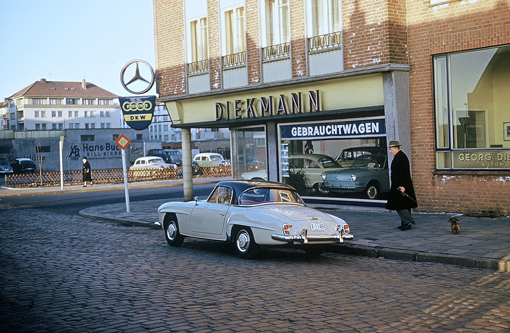 Here is the 190SL that I sold to Lieutenant U.S.N., Bob Granger in Bremerhaven "Am alten Hafen" 117 in 1960. We became friends at that time and met every time Bob returned by U.S.N. vessel to Bremerhaven. 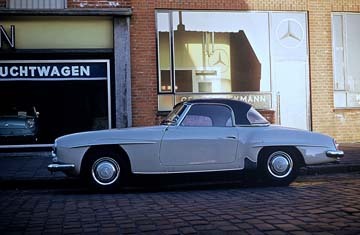 His new 190SL was a light grey with full leather upholstery. 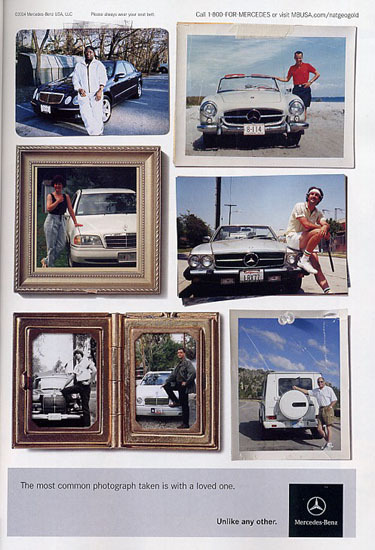 Hartwig's photo of Bob Granger was used (with permission) in a 2004 Mercedes-Benz advertising campaign. 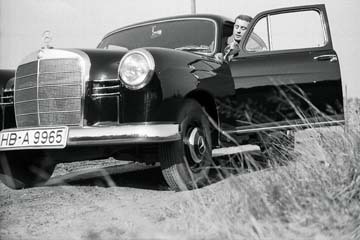 Bob Granger took this photo of his brand new 190SL on January 14, 1961. It was directly outside the Diekmann Automobile showroom. Another photo of my friend Bob Granger with his Type 220S Ponton in 1962. Thanks to the mbzponton.org website, we found each other again after more than 40 years. 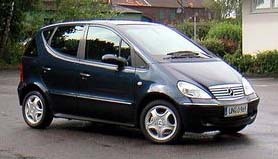 Bob in the meantime was almost never without the three-pointed-star, and just four weeks ago (October 2002) took delivery of his new E-Class. That is the story about and around these two particular photos. Bob is now married and living in Sanford, North Carolina USA. 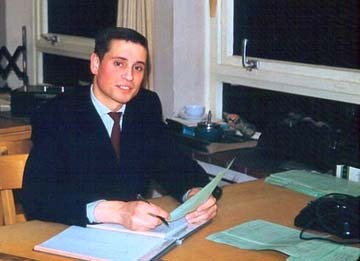 Hartwig at home in 1999 looking at some Mercedes-Benz "prospekt" folders. 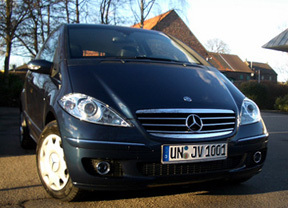 Hartwig and his family are still driving (besides a Peugeot 206 HDI) a Mercedes-Benz, and he continues to support the new ideas included in the latest models! 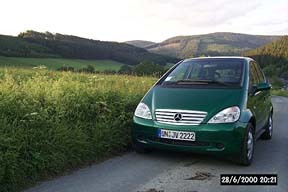 Mercedes-Benz A-Class 170 CDI Avantgarde that Hartwig was driving in 1999. 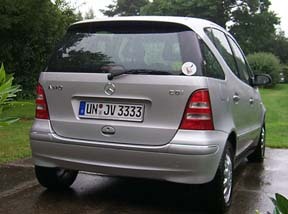 2001 Type A170 CDI Elegance (trim level designation). 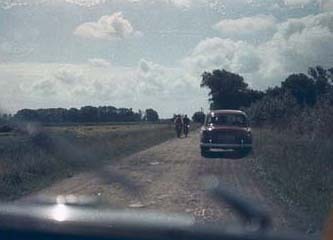 This photo was taken with a Kodak digital camera in August 2001 while on vacation on Darss Island, East-Sea region near Rostock. Regarding the diesel engine on these A-Class vehicles, Hartwig says, "I am an absolute diesel fan and would never buy any Mercedes-Benz with a gasoline engine. You should drive these new diesel engines to be convinced of them. They give me a 100% reliable feeling in summer and winter. 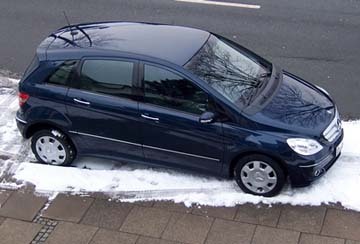 This is a 2002 "Atoll-Blue" A170 CDI Avantgarde automatic that Hartwig ordered in the spring of 2002. With another new year, Hartwig was driving yet another new Mercedes-Benz! As a result of buying this car (his fifth new A-Class since 1999), DaimlerChrysler, Stuttgart, sent a big personal thank-you letter and package for his brand loyalty. 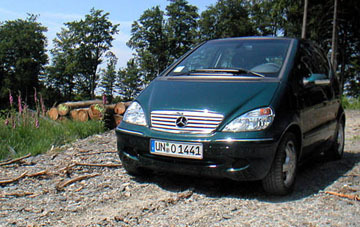 This green Type A170 was ordered in April 2003. 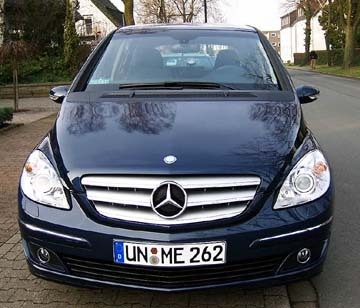 And here is a photo of my new (January 9, 2005) A-Class (180 CDI Avantgarde 2-door coupé 6-speed), which - today about noontime - my salesman, Herr Michael Hengst, delivered to me here at home. Every year there is a little ceremony and I am already fixing the date to order the next one in October of this year for delivery in January of 2006, then with the Automatic again and the curved-headlights and Bi-Xenon. December 29, 2005: "Let me introduce you to my new 2006 Type B180 CDI Automatic sedan"
Here are some photos from Hartwig's old Bremerhaven times from 1956 to 1964 working as a Mercedes-Benz salesman in the Port of Embarkation Bremerhaven (PEB). 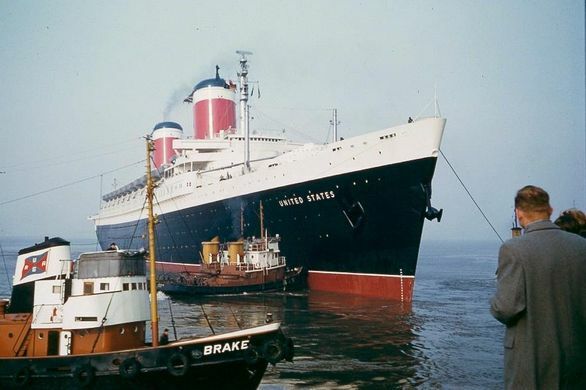 The S.S. United States (built 1950-1952 in the USA) arriving at Bremerhaven Columbus Bahnhof. This dreamlike photo is a wonderful composition that gives the viewer a sense of the close relationship the Bremerhaven people had with the shipping industry and its sea going passengers. 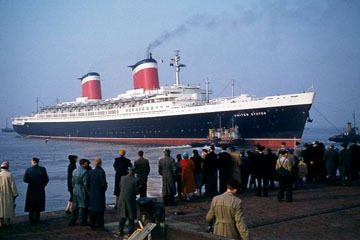 At that time, there was a shuttle that sailed between New York and Bremerhaven on a monthly schedule. 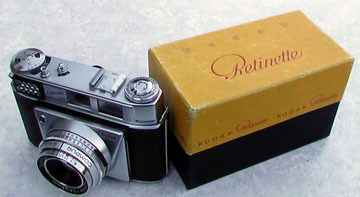 The photos of the S.S. United States were taken with ASA 25 Kodachrome film during the second half of 1956, and the camera was this Kodak Retinette IIb that Hartwig got on Christmas 1955. The S.S. United States in the second half of 1956 arriving at Bremerhaven Columbus Bahnhof. 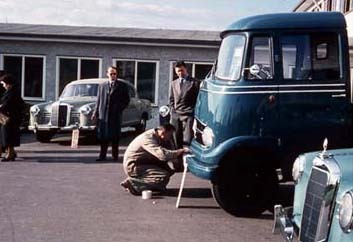 A "Medium-Blue" W120 180D Ponton demonstrator during the extremely hot summer of 1959. The location was Bremerhaven Fischereihafenschleuse. 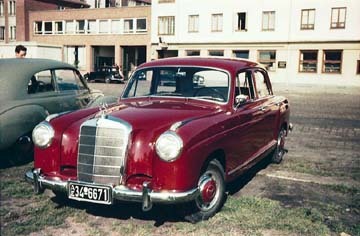 A new "Medium-Red" M-B W105 219 sedan waiting to be handed by the salesman to Firma Endmann, Am Alten Hafen, situated in the direct neighborhood of M-B Diekmann Automobile. In the background it shows the (north) final point of "Alter Hafen" (Old Port), where today you find Columbus Center and famous ships museum. 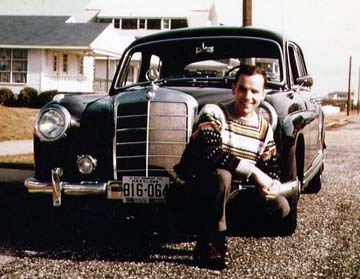 Here is Walter Hannemann in 1957 with two Pontons. You can recognize my friend Wolfgang Kehl in the Type 219 cockpit too. A lot of the U.S. Servicemen having been stationed and living for years in Bremerhaven Housing will remember the famous and almost legendary Chief Mechanic and "Meister" Walter Hannemann of Diekmann Mercedes-Benz helping them to forget their problems. Walter Hanneman was a good friend of mine too. I enhanced the photo of Walter so that people who knew him can now recognize his face better. Walter's outfit with the short pants (here they are called "Knickerbocker"), and very importantly, the red notebook in his front pocket, was always the same. So, those who used to know him at that time would recognize him without looking at his face. Yes, that is absolutely true. Almost every day, we went out with him inviting him for a coffee. We used to say, "Walter, I have a little noise on my demonstrator. Do me a favor to listen to it." Next we went to one of the coffee shops in the city, stopped there and invited him for coffee. 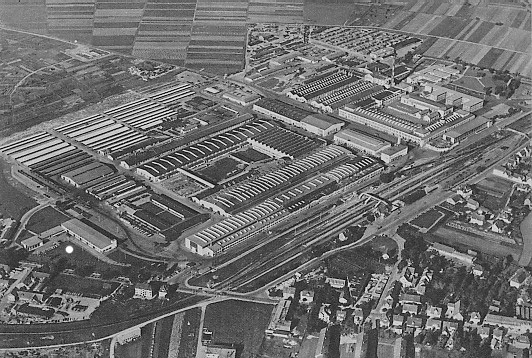 "Same procedure every day..."
In the aerial photo of the Sindelfingen Works, I marked the point where I used to pick up many new cars, which I then drove to Bremerhaven and Diekmann Mercedes-Benz. 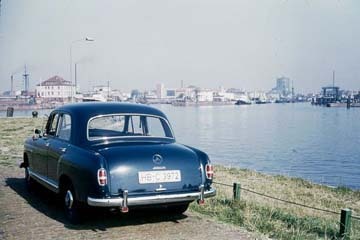 I first "entered" Sindelfingen in 1956 as a 19 year old apprentice to pick up new automobiles and "ship" them via the Autobahn that long way to Bremerhaven. I went to Sindelfingen by train from the Bremerhaven Main Station in the evening and reached the Stuttgart Main Station sometime in the early morning, usually by 6:30. I remember there were Shuttle-Busses of Daimler-Benz AG waiting, and offering a free ride to Sindelfingen to those people coming from other places. They could be recognized by carrying red temporary (three days) tags with them. The bus ride took about half an hour, and then we reached the famous Sindelfingen factory at the point I marked on the photo. 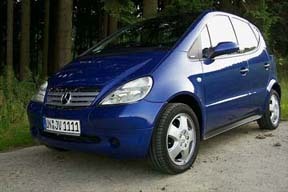 I still have the beautiful smell of all these brand new Mercedes-Benz sedans and L319 vans in my nose. 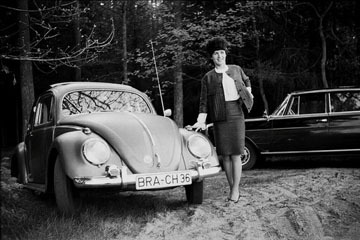 I had been learning the job as an apprentice (while being examined) for three years with Diekmann Mercedes-Benz. Since I was much older than a normal apprentice when I started (leaving school without going to university at 19 years of age) from the first day on I was integrated into the crew more and more. In addition, my advantage was my fluent English in connection with many American customers as a result of Bremerhaven's important port (Columbus-Bahnhof and Kaiserhafen). Another plus was the US barracks and an enormously large US housing settlement in the town called "Suburb of New York." 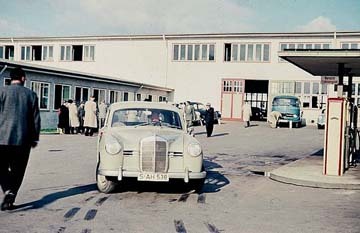 The building on the left side of this photo was the Delivery-Center, where people picking up their new cars had to enter before to handle all the administrative material (temporary tags, temporary registration, permission from the Mercedes dealer to hand over the car to the customer) because each car must have been previously paid by the dealer at Daimler-Benz AG, Stuttgart-Untertuerkheim, before it got permission to leave the factory-borders. The gentlemen you can see outside the building in their beige outfits are Mercedes-Benz employees insuring that the cars would leave the factory ground in good shape and with the temporary tags fixed. Hartwig Mueller picking up a brand-new L319D "Pritsche"
The Type L319D and two Pontons waiting to be picked up. The year is 1956. 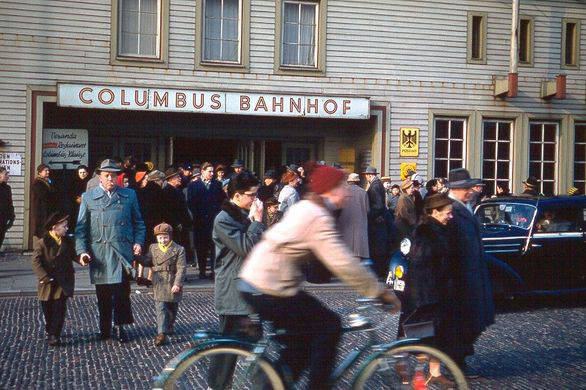 Bremerhaven Columbus Station with a Mercedes-Benz Type 170SD taxi-cab that Americans will remember in the older style black paint with a white stripe (like a belt) underneath the windows. Today's taxi-cabs in Germany use beige paint, and have for many years. 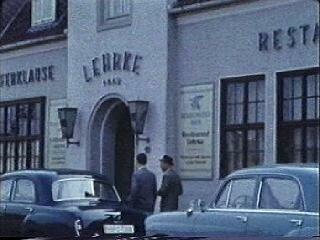 M-B salesmen entering LEHRKE restaurant for their daily break in 1961. 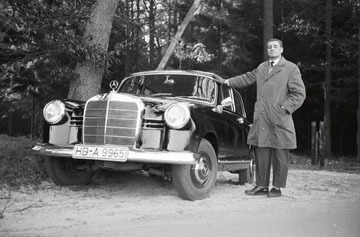 H.M. in a black W121 190Db demonstrator in 1960. Notice the pre-radial tires at that time. These are the old bias-ply tires. "It was the same year that Michelin started an offensive with their X-tires, as I remember." 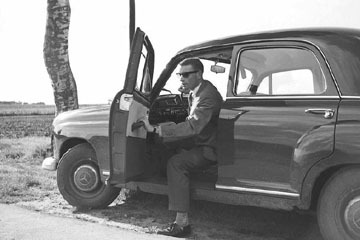 H.M. leaving a black 190Db demonstrator in 1960. 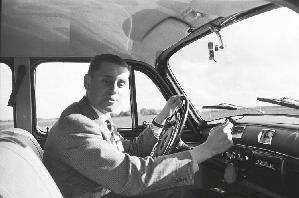 H.M. behind the wheel of a W121 demonstrator in 1960. The location was "Landkreis" Wesermuende – 10 miles from Bremerhaven. H.M. "in action." 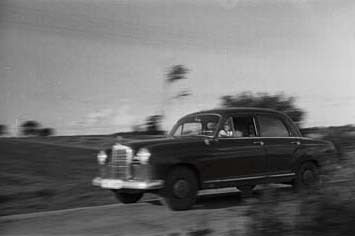 A dynamic photo showing me on my way to a customer who wants to order a new Mercedes-Benz !!! Now seriously, same year, same place. 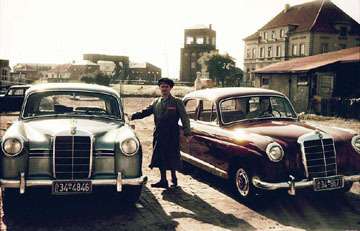 ADAC 1956 WesermarschRallye with a "Medium-Red" Type 180 Ponton. A "Moss-Green" Type 180 Ponton at the ADAC 56 Rallye Final in Nordenham. 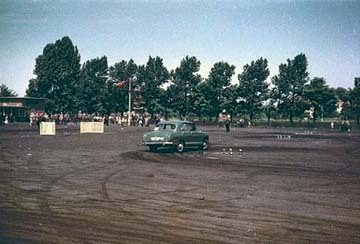 Note the Aral (European brand of petrol) oil can "pylons" placed on the slalom course.